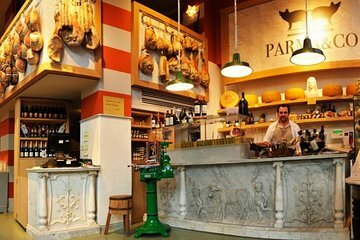 Rencontrez votre guide gastronomique local à la station Lanza-Brera, dans le centre de Milan. Ensuite, dirigez-vous vers Brera et commencez à vous familiariser avec l'histoire de la cuisine et des repas milanais, allant de la polenta copieuse au veau pané à la milanaise en passant par le risotto safrané. Arrêtez-vous dans six restaurants, cafés et marchés pour goûter aux délices de la région. Les dégustations varient en fonction de la saison, mais le melanzane alla parmigiana (aubergines cuites au four avec parmesan et tomates), les boulettes de viande du mondeghili et les plats traditionnels milanais font partie des plats probables. En plus des spécialités locales, dégustez des spécialités italiennes telles que le gelato et le cannoli, ou des morceaux de culatello fondant dans la bouche, un jambon de Parme prisé. Puis goûtez à la bière artisanale et à un apéritif traditionnel du nord de l'Italie. Terminez la visite dans le centre de Milan. The tour was a small group of 12.we started with pastries. Then we had apertivos, followed by risotto rice. Then we had Italian food, followed by gelato.BTW the gelato place was a chain because on the cups they mentioned a location in Hollywood, Fl near to where I live!!! I think the price was high for what we got. I think .the area was nice to see . This was a very good experience. The selection of foods and stores were both interesting and of very high quality. The tour guide was very good but not quite as good as a tour guide we have had in Paris. I would strongly recommend the tour and feel we did have a very good experience. The Brera district is beautiful and is a good place to experience food. This is a must do tour if you love food and local neighborhoods. Our guide, Paul, was so knowledgeable and fun. We had 12 of us on our tour - we were the only Americans with 3 separate fun groups from Australia. We started at a coffee/pastry shop, off to beer meats/cheese, Milanese risotto, lasagne, a local wine shop and gelato. At each stop we received an explanation of the importance of why we were there and the history of what we were eating. This is a great way to visit a local neighborhood and try some of the local cuisine. Eat a really light breakfast, and this is plenty of food for your lunch for the day. I was pleasantly surprise by this tour. My tour guide Debra was great, took us to several eateries. We'd big portion of prosciutto, parmesan cheese,and beer. Next we tasted, lasagna, two types of meatballs, one boiled in broth and the other fried in the clarified butter. Bread with green olives to follow. There was a good wine and on the end we had gelato. On the way to different tasting places Debra told us about the history of Milan, just enough to get you interested. This is a must do! Great walking food tour with a little bit of history lesson. We sampled a lot of great food and some beer and wine. We did a lot of walking and like how each place is spread out. We left very full! Fantastic walking tour, full of information on architecture as well as the surrounding areas demographics. Enthusiastic guide and the food was awesome. 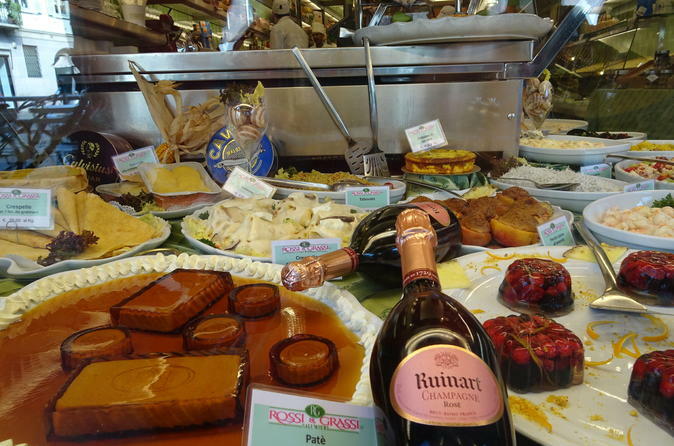 Suggest doing this on your first day in Milan as it quickly shows you the characteristics of the various eateries, where to go and what to eat saving a newcomer to the city the delima of finding suitable authentic eateries at reasonable prices. Sampled great food and learnt lots about Italian food that we didn't know. Great tour, lots of food info as well as history of the area, great variety of food.